This article is the latest in a series which introduces Series Points, a new ranking method for Test players which directly compares all players together (i.e. batsmen and bowlers as well as fielding ability), whilst also awarding more points to players who performed well against stronger opposition (the original article has a more detailed description of series points for teams and individuals, suffice to say here that we divide up the team series points [TSPs] into individual series points [ISPs] based on their performances with bat, ball and in the field). I also covered in the original article the Test Player of the Decade for the 1930s, following which we have looked at the 1920s, 1940s, the 19th century, 1900-14 and the 1950s. The top players are presented using two variations on ISPs, total ISPs and ISPs per 5-game series (basically points-per-match, but multiplied by five to make the variations easier to see). Gary Sobers was way ahead of everyone else – having taken three awards from four at the end of the 1950s, he proceeded to take six in a row to start the ’60s, giving him an unprecedented nine awards from 10 series! His scores included 189 ISPs (worth 25.2% of the team series points, and the highest score of the decade) against England in 1966, in which he scored 722 runs, took 20 wickets and held 10 catches, and 172 ISPs against India in 1961-62 (424 runs, 11 catches and 23 wickets); also his performance of 112 ISPs against India in the three-Test series of 1966-67 extrapolates to 187 ISPs. He was also the top-scoring West Indian player in two losing Test series, and he was personally responsible for scoring almost one-fifth of his teams series points in the first six series of the decade. Ted Dexter‘s three awards were in consecutive series, against Pakistan (twice) and Australia 1962-63. One of Fred Titmus‘ awards was shared with Jim Parks (Eng) and Bill Lawry (Aus). Ken Barrington enjoyed something of a purple patch in the summer of 1967, taking honours against India and then Pakistan, during which three-Test series he scored 105 ISPs (equivalent to 175 over five Tests) while scoring a century in all three Tests. India’s Erapalli Prasanna returned to the Test team in the second part of the decade and took the series award in three consecutive series, New Zealand (twice) and Australia. Sobers is slightly ahead of Barrington, but played in far fewer Tests. England played in 95 Tests during the period in question, followed by Australia (68), India (49), West Indies (44), New Zealand (43), South Africa (35) and Pakistan (30). Sobers was the only player to appear in all of his countries’ Tests in the ’60s, and Lance Gibbs (WI) and Hanif Mohammad (Pak) missed only two Tests. Bob Simpson (Aus) was close to taking a series award in the 1964 Ashes, finishing just behind Graham McKenzie, and he would score highly throughout the decade. If the question of England captaincy during the ’60s was not always settled in Colin Cowdrey‘s favour, there can be no doubting his playing contributions to the team during the period – he was the only player to finish in the top 10 in both the 1950s and 1960s. In addition to his series award in the 1964 Ashes (29 wickets), Garth McKenzie also scored very highly against the West Indies in 1968-69, when he took 30 wickets. Now, let’s look at each player’s points per five-Test series (PP5), i.e. the average number of points the player would have scored in a five-Test series, based on his average points per match multiplied by five (as we did in the previous articles). This gives us a better idea of each player’s level of performance, as it is not based on the number of Tests played – for example, the top 10 based on total ISPs does not include any players from South Africa, even though they were ranked top by the end of the decade. To say that Sir Garfield Sobers was the Player of the Decade is to ridiculously understate the case. He finished with a PP5 average more than 20% better than the next player, Allan Davidson, who played in only 14 Tests as compared to 44 by Sobers. In fact, before his slight decline in form (at least in Tests) towards the end of the period he was at one point averaging more than 150 ISPs! He is largely responsible for the West Indies rise to become top-ranked nation from 1963 to 1968. Allan Davidson played at a very high level right to the end of his career, finishing just behind Sobers against the West Indies in the famous 1960-61 series, and taking the series award in the 1961 Ashes. Bob Simpson also maintained a high level of play over a long period, finishing in the top three in both total and average ISPs. His highest series score was during the 1964 Ashes, where he amassed 311 during the Old Trafford Test. Fred Trueman continued his fine form of the previous decade, and indeed was slightly better in terms of average ISPs. 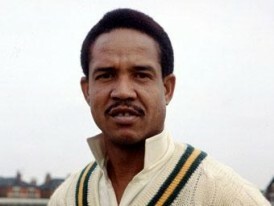 He was particularly effective against West Indies in 1963, taking 34 wickets and finishing with England’s highest ISPs. Trevor Goddard was the only player other than Sobers to figure in the top 10 in both the 1950s and 1960s. He took the series award against Australia in 1966-67, with almost 300 runs and 26 wickets. Ray Illingworth was solid if not spectacular throughout the ’60s, although his first Test century, against West Indies in 1969, was to give him his only series award of this decade. Widely considered one of the finest left-handed batsmen to ever play the game, Graeme Pollock averaged more than 60 over his Test career, including a magnificent 274 in South Africa’s final Test series before their isolation. Salim Durani was the difference in India’s series win against England in 1961-62, taking 18 wickets in the final two Tests to give him the series award and help India win. Eddie Barlow took the series award in only his second series, against the Australians in 1963-64, in which he scored three centuries, one of them a double, and his performances against England in 1964-65 and the Aussies in 1969-70 also earned him high points scores. The Player of the 1950s, Richie Benaud, rounds out the following decade’s top 10. While not as dominating as previously, he still ranks as third-best Australian player of the decade. We have to make mention at this point of the South African team which demolished the Australians 4-0 in 1969-70, only to be removed shortly after from the list of Test-playing nations. Mike Proctor took the series award with 127 ISPs, but he was closely followed by Eddie Barlow (118), Graeme Pollock (101) and, making his debut, Barry Richards (100). Add to that list Trevor Goddard and we can see what a magnificent team the world was denied through that country’s political stance. If they had qualified by number of Tests played, Proctor and Richards would have finished second and third in the PP5 table. We’ll take a look at the 1970s.